For the eighth time in 2017, there will be a full field this Sunday, and for just the third time this season, one car will be sent home after qualifying. Returning this week are two teams with very different partial schedules. Motorsports Business Management returns for the first time since Kentucky, and for the first time since Kansas, team owner Carl Long is the listed driver. Long has never started the Brickyard 400, and his two previous entries in 2000 and 2005 were both withdrawn. Joining MBM is Tommy Baldwin Racing, which we last saw earlier this month at Daytona. In place of plate driver Elliott Sadler is their intermediate driver J.J. Yeley, who has six Brickyard starts with a best finish of 28th in 2008. Gray Gaulding confirmed on Twitter last week that his two-race stretch for Premium Motorsports has been extended into this Sunday’s race, and he will again pilot the #55 Toyota. This time, his car will be sponsored by Low T Centers, which has backed both of Premium’s cars for much of the season. Joining Gaulding this week is XFINITY regular Joey Gase, whose turn in the #15 Chevrolet will raise awareness for brain aneurysms through The Lisa Colagrossi Foundation. For the second time this month, B.J. McLeod will run double-duty at Indy, where in the big show he will again campaign Rick Ware Racing’s #51 Chevrolet. It is as of this writing unclear who the team’s sponsor will be, or if he will again run the former Clemson University car without the college’s decals, as he did at Kentucky. For the third time in four races, BK Racing will again run Corey LaJoie in the #23 Toyota and Ryan Sieg in the #83. The duo struggled last week at Loudon, both running two laps down and finishing 31st and 32nd. Both are expected to make their first Brickyard 400 starts. Give a call to Matt DiBenedetto, who last week earned a season-best 16th starting spot at Loudon. The run equaled his career-best at the same track last year for BK Racing. Unfortunately, the finish was also nearly identical – 30th on Sunday, up just one from 31st in 2016. Looking for a much-needed turnaround is Cole Whitt, whose TriStar Motorsports #72 Chevrolet has had five engine failures in the last eight races, including the last three races in a row. The Brickyard’s long straightaways will be one of the biggest tests for TriStar’s engine department. Whitt’s best finish in three Brickyard 400s was a 29th last year for Premium Motorsports. Curiously, TriStar has made just one start before in this race – a last-place “start-and-park” effort by Mike Bliss in 2012. Their rookie driver Loy Allen, Jr. was among the 43 drivers who failed to qualify for the 1994 inaugural. Last week at Loudon, Motorsports Business Management’s late entry of John Jackson in the #72 Chevrolet prevented the series’ first short field of 2017. This week, Jackson is not on the list as, following the withdrawal of Biagi DenBeste Racing’s #98 for Casey Mears, there are exactly 40 cars for 40 spots. Among those locked-in will be Morgan Shepherd in his #89 and Reed Sorenson in JD Motorsports’ #15, which made its first “start-and-park” effort last week in Loudon. Missing from this week’s list is Martins Motorsports’ #45 Diamond Gusset Jeans Chevrolet, which was earlier this year slated to return this weekend. Tommy Joe Martins tweeted Monday that he will continue to drive for B.J. McLeod Motorsports for as long as he’ll have him. Sure enough, he is again driving the #78 on Saturday alongside McLeod in the #8 and the #99 Striping Technologies Chevrolet of David Starr. McLeod confirmed last week that the #99 is owned by his team and is operated by Bobby Dotter of SS Green Light Racing. Tomorrow night, 34 drivers will wage war in the lone dirt track event on the schedule. Norm Benning, the lead story of the 2013 inaugural for his thrilling battle in the Last Chance Qualifier, looks to make his first start in the event since his track-best 19th in 2015. For the first time, Benning will field two trucks in this race, bringing out the #57 that has run a handful of races this summer. As of this writing, there is no listed driver for this second truck, which earlier this year was driven by Tommy Regan, J.J. Yeley, and B.J. McLeod. Before he heads to Indy, Yeley will drive D.J. Copp’s #83 Fr8Auctions.com Chevrolet. Two more teams are currently listed without drivers. The first is Jennifer Jo Cobb Racing’s flagship #10 Driven2Honor.org Chevrolet (Korbin Forrister is already listed in Cobb’s second truck, the #0). Cobb made her way into the last two main events at Eldora, finishing 27th in 2015 and 26th last year. The other entry without a driver is Bryan Hill’s #20 Young’s Building Systems Chevrolet, the team Tyler Young drove for in Iowa. For the first time this year, both Stewart Friesen and his Stewart-Friesen Racing return to familiar territory. The veteran dirt-tracker made his series debut here last year, finishing 28th. But there’s a large number of other dirt track stars with eyes on victory. Making his own series debut is sprint car racer Max Johnston, who brings sponsorship from Brandt Agriculture to Randy Young’s #02 Chevrolet. 2016 Southern Sportmod Champion Jeffrey Abbey will do the same, the Texan switching from his late model to Al Niece’s #45 Black Riffle Coffee Company Chevrolet. USAC wingless sprint racer Chris Windom, fresh off a win in Pennsylvania’s Eastern Storm, climbs through the window of MB Motorsports’ #36 Chevrolet. Windom will have a good teammate to take notes from: Bobby Pierce – so close to winning the last two Eldora races from the pole – will once again pilot the cherry-red #63 Gotta Race Chevrolet. Unlike the last two years, Pierce’s truck will carry the current 2017 Chevrolet sheet metal. Also returning are four-time track champion J.R. Heffner, looking to improve on his track-best 4th-place start and 15th-place finish last year, and late model racer Justin Shipley, who will again drive Tracy Wallace’s #80 Ford. XFINITY Series part-timer Brandon Hightower will return to his late model roots when he drives in place of Jordan Anderson in the #1 TJL Racing Chevrolet. 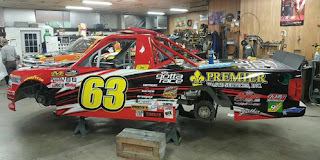 So will NASCAR legend Ken Schrader, who this year takes a turn in Bolen Motorsports’ #66 Chevrolet, a team which last year with Anderson were determined to get their truck into the main event. Then, of course, there’s west coast sprint car star Rico Abreu, who returns to the Truck Series and ThorSport Racing for the first time this year in the #89 Curb Records Toyota. 83 of Ryan Sieg has withdrawn Cup race.